More than three years after supertyphoon Yolanda devastated the Visayas, affected communities has been making gradual but significant progress on their path to complete recovery. More than merely rebuilding, many residents, organizations, and agencies are adopting the principles of “building back better”—a way to make sure that reconstruction efforts focus on resilience. Tacloban City was one of the most severely devastated areas during the onslaught of Yolanda, but it has continued its own efforts at post-disaster rehabilitation. Together with partners, supporters, and its own efforts, the City of Tacloban is working toward making itself more resilient. 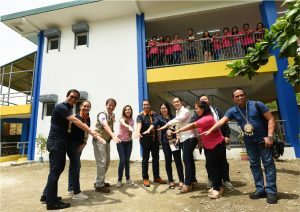 On July 26 this year, Ayala Foundation, in partnership with the Philippine Disaster Resilience Foundation (PDRF), ceremonially turned over an evacuation/multipurpose center at the Dr. Agustin Bañez Memorial Elementary School in Tacloban City. 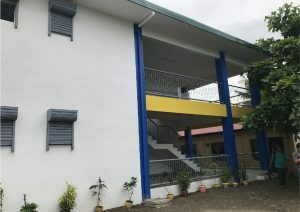 The two-story structure features a multipurpose hall on each floor, for use in special activities for the school and the community, as well as potential evacuation center in times of calamity. On regular days the halls can be divided into smaller spaces, for use as classrooms. The evacuation/multipurpose center at the Dr. Agustin Bañez Memorial Elementary School is PWD-accessible. 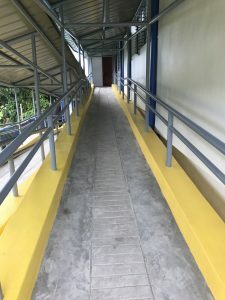 The building also features four restrooms and a sprinkler system, and wheelchair ramps for both floors, in compliance with accessibility standards for persons with disabilities. 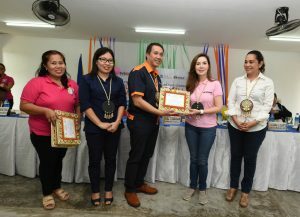 The ceremonial turnover was supported supported by the City Government of Tacloban, under the leadership of Mayor Cristina G. Romualdez and Vice Mayor Jerry Yaokasin. Also present at the launch were Rene Meilly, PRDF president; Joanna Duarte, Ayala Foundation senior director for Programs; and other city officials. The Ayala group of companies has invested roughly half a billion pesos for relief, recovery, and rehabilitation efforts for communities devastated by Typhoon Yolanda. One of its efforts was focused on the construction of disaster-resilient classrooms and school buildings, supported by education and livelihood programs. 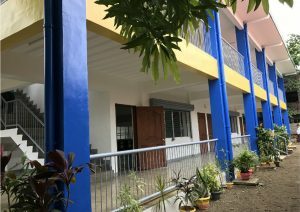 From 2014 to 2017, Ayala Foundation oversaw the construction of eight school buildings, with a combined total of 40 classrooms, in Negros Occidental and Iloilo. One area also received support in the form of access to a proper water system.